If you have been having symptoms, or have a cancer screen or medical examination that reveals a lump that could be a tumour, this is a very worrying time. Further tests will be done to find out exactly what the lump is and to find out what kind of treatment is likely to benefit you the most. An important procedure in cancer diagnosis, whether it is for a breast lump, a suspicious mole or problems with urination that might indicate prostate cancer, is a biopsy. This is a small operation that will either remove the lump and a portion of normal looking tissue around it, or will remove a few cells or part of the tumour. This sample is then looked at under a microscope to find out exactly what types of cells are present. It is commonly thought that cancer is either malignant – dangerous and prone to spreading to other parts of the body – or benign. A benign tumour does not invade other tissue and does not spread, although it can cause problems if it presses on important blood vessels, nerves of organs. In fact, cancer is a wide spectrum of diseases and some cancers that are malignant are more dangerous than others. Part of the purpose of a biopsy is to find out if the cancer is very aggressive and likely to grow and spread quickly. If the biopsy was sufficient to remove the tumour and the surgeon and histologist are reasonably confident that the entire tumour has been removed, then you may not need another operation. In most cases, however, subsequent surgery is required to make sure all of the cancer cells have been removed. For many cancer operations, it is not enough for the surgeon just to remove the tumour itself. It is difficult to look at the tissue during surgery and find out anything useful. The margins of the tumour may not be clear and it is difficult to tell whether a cancer has started to spread. In order to find out as much information as possible during the operation, it is common for the lymph node nearest to the tumour to be removed and then to be examined under the microscope to see if it contains any cancer cells. The lymph node nearest to the tumour is the place where lymph fluid from that lump passes first, so it is the most likely place to find any cancer cells that have started to spread. If the sentinel lymph node, as it is called, is to be found completely free of cancer cells, it is more or less certain that the cancer has been contained in the original tissue, and removing it entirely is likely to give a very good chance of survival. For some cancers, in the head or neck for example, it is difficult to know which lymph node is connected most closely to the tumour so it may be that the surgeon decides to remove several lymph nodes from the neck and examine them all. This more extensive operation to remove lymph nodes is called a lymph node dissection. 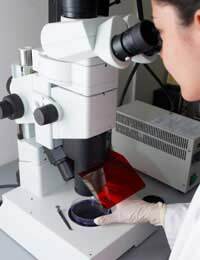 When the lymph nodes have been examined under a microscope by a qualified histologist, he or she is able to report back to the surgeon more about the type of caner that is present. Cancers are staged according to how big they are, how aggressive they are and how far they have spread. A cancer that is present in a sentinel lymph node but not other lymph nodes is considered more advanced than a cancer that has not spread at all. A cancer that has spread to more than one lymph node is more serious, and the cancer that has spread beyond the nearby lymph nodes and into other parts of the body such as the bones or the liver, is the most serious of all. One of the major side effects of having lymph nodes removed is the risk of having some of the lymph vessels damaged or cut. This interferes with the normal flow of lymph fluid from the tissues, and can lead to swelling in the arms, legs or abdomen. Women who have had surgery for breast cancer, often find that they develop long term swelling in the arm on the affected side. This condition is known as lymphoedema.